“Hundreds” of Grab Bike’s drivers lined up in front of Go-Jek’s registration office in South Jakarta earlier today according to local media reports. These drivers, or driver-partners, as ride-hailing platforms like to call them, decided to register a new account with competitor Go-Jek, allegedly due to collective dissatisfaction with a new incentive scheme at Grab. The new incentive scheme, called ‘Berlian’ (or Diamond), is considered very burdensome to drivers. Drivers are required to earn 110 virtual “diamonds” in order to get the incentive or bonus worth IDR 15,000 (about US$1). “This is very difficult for us since one trip equals eight diamonds only, regardless of distance,” Asmi, a 40-year-old Grab driver who went to Go-Jek this morning, told KrAsia. He went with his colleagues, all members of ‘Grab Bike Big Family Depok’, a community formed by Grab drivers from the Depok district just outside of Jakarta. Asmi said the plan to switch over to Go-Jek had been circulating within Grab drivers’ social media and WhatsApp groups for a few days now. In their eyes, the new policy doesn’t benefit drivers at all. The minimum diamond level of 110 gives just a small reward, while the highest diamond level is 550 with a bonus of IDR 190.000 (about US$13). Moreover, it is very difficult, if not impossible, to get that maximum diamond value within a day. To add on, Grab already subtracts 20% of a ride’s fare for each trip. “Yesterday, I started working very early around 6 in the morning and finished at 10pm but I still couldn’t reach the maximum diamond level, therefore I only earned very little bonus. Lately, we feel that Grab’s policy only benefits the office rather than us partners (drivers),” Asmi added. Asmi and a number of his colleagues who registered with Go-Jek this morning also participated in a series of protests at Grab’s office that took place in September and October, demanding better compensation and a more transparent incentive system. Grab at that time said those protests were instigated by disgruntled ex-drivers whose accounts had been suspended over term violations. However, many still seem to be dissatisfied with Grab’s updated incentive scheme, and they opted to join the competitor. “Go-Jek’s incentive policy seems better, so we chose to move for good,” Asmi continued. The timelines of many Grab driver groups and accounts on Facebook and on Twitter were filled with posts about how to register with Go-Jek today. 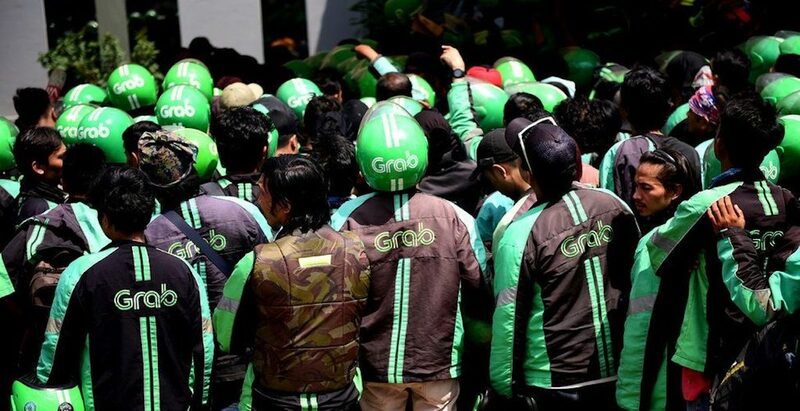 Many accounts shared live updates of the crowd that gathered outside of Go-Jek’s office, while a few shared their complaints towards Grab’s management. Grab Indonesia’s official Twitter account has not commented on the situation so far and a Grab spokesperson also wasn’t available for comment today. Grab has said it has 2.6 million drivers in its network across Southeast Asia, without specifying how many of those are in Indonesia. It has said that Indonesia is its biggest market. The firm, which first launched in Singapore in 2012, is now thought to be worth over US$10 billion, as a fierce competitor to Go-Jek, a company homegrown in Indonesia. Maintaining the perfect fleet size in an on-demand network is no easy feat, as too many drivers mean fewer earnings for each and too few can mean longer wait times. In general, drivers at both Grab and Go-Jek have complained about declining incomes as both networks have grown exponentially over the past few years. This article was written by Khamila Mulia (edited by Nadine Freischlad), and was first seen on KRAsia.